I haven’t covered My Tribe for a while, which I am a little ashamed of, since it was the topic of my very first post on this blog. So I’m getting back to my roots a bit. Here’s a bunch of stardust for you – hopefully all of them will work for you, but don’t be surprised if some just don’t. I can’t really control it, and although I had some friends test it, I don’t know how well this will stand up once thousands of people try claiming this. 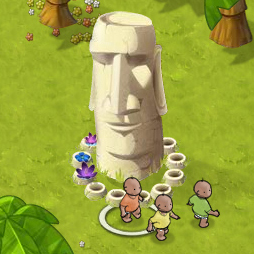 Huey, Dewey, and Louis take a visit to "The Big Head Guy"
The Stone Head Mystery resembled the Moai statues of �Easter Island, but unlike its real life counterpart, the mystery of these stone heads are easily solved. If you drop any tribesman on it, they experience a feeling of warmth and peace. But then nothing else happens. Have you noticed that when you drop a child on a villager that the frown they had goes away?